There is way too much here to try to summarize, so let me just give you a couple of tastes. manipulates the metabolism of plants so that the growth or vegetative phase can be morphed into a reproductive phase when desired. Cracks in the cuticle of the plant leaf, and also stomata, which are open in the cooler times of the day, are the entry points for foliar nutrition. 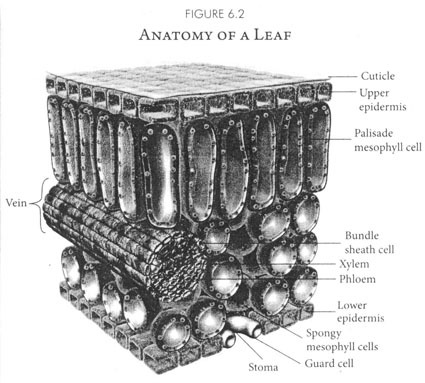 This chapter discusses, along with leaf anatomy, timing for foliars (of the day and in the plant’s life), necessary physical characteristics of a successful mix, temperature parameters, and appropriate equipment to be used. Sticking agents and solution pH (finished tank between 5.0 and 6.0) are considerations to manage. Seaweed extracts, humic and fulvic acid, sea crop (a sea water product that has had most of the NaCl removed), blackstrap molasses and fish hydrolates are all components favored by the author. I became a foliar fanatic about 4 years ago. Though I have been using mixes of commercially formulated fertility products, along with trace minerals, to good success, I have been on the search for the perfect homemade foliar spray. I think I found it here and will be using it regularly this summer. It features one of my favorite bio-accumulator plants, which I have growing all over our farm. It is comfrey. Already convinced of their incredible capability to improve fertility, manage soil air and water, and build organic matter, in this chapter I was most interested in how to successfully increase the number of earthworms in a shovelful of dirt. Earthworms need an aerobic, cool, moist environment with adequate organic materials to flourish. They prefer soils with a pH between 5.5 and 8.5, and that has adequate calcium levels. That element is necessary for the mucus secretions of their calciferous gland. Direct contact with ammonia fertilizers (including slurry manure), insecticides, and tillage are hazardous to earthworms. A healthy soil food web that includes good numbers of protozoa will attract a strong earthworm population. Using alfalfa products as mulches, in compost teas, and as soil amendments will attract the protozoa that feed the worms. An interesting fact that I learned in this chapter was that Charles Darwin studied earthworms for 39 years and published an important work on them in 1881. No scientist prior to Darwin had taken such an interest in earthworms, and many believed them to be vegetable pests that attacked plant roots as do parasitic nematodes. This tome is a textbook, a storybook, a practical how-to manual, and an inspiring call to action all in one wrapper. Jerry’s love of science, nature, farming, and humankind is a constant throughout the book. That enthusiasm kept me going until the end. Even during those periods where it got too “deep” for me to understand, I could always count on a return to practicality and lessons for me to put into place on our farm in 2014.